A simple and delicious Fettuccine Alfredo is just moments away from your table. This recipe (with a few modifications of my own) comes from America’s Test Kitchen. Tip #1: Use fresh pasta whenever possible. There are so few ingredients, the fresher they are the better. Tip #2: Always heat your pasta bowls/plates. Cold serving bowls can ruin your dish. 1. Bring 4 1/2 quarts water to rolling boil, covered, in large stockpot or Dutch oven. Using ladle or heatproof measuring cup, fill each individual serving bowl with about 1/2 cup boiling water; set bowls aside to warm. 2. While water comes to boil, bring 1 cup heavy cream and butter to simmer in 3- to 4-quart saucepan over medium heat; reduce heat to low and simmer gently until mixture reduces to 2/3 cup, 12 to 15 minutes. Off heat, stir in remaining 1/2 cup cream, 1/2 teaspoon salt, and pepper. 3. Add 1 tablespoon salt and pasta to boiling water; cook pasta until just shy of al dente. Reserve 1/4 cup pasta cooking water, then drain pasta. Meanwhile, return cream mixture to simmer over medium-high heat; reduce heat to low and add pasta, Parmesan, and parsley to cream mixture. Cook over low heat, tossing pasta with tongs to combine, until sauce coats pasta and pasta is just al dente and cheese is melted, 1 to 2 minutes. Stir in reserved pasta cooking water; sauce may look rather thin but will gradually thicken as pasta is served and eaten. Working quickly, empty serving bowls of water (quickly wipe out excess water so as not to water down sauce); divide pasta among bowls. Serve immediately. Picture it, I’m running through the Santa Fe Plaza Arcade with the wonderful smell of coffee tempting my nose, like a carrot being dangled in front of a rabbit. After a few failed attempts at locating the source of my afternoon craving, I finally found it. 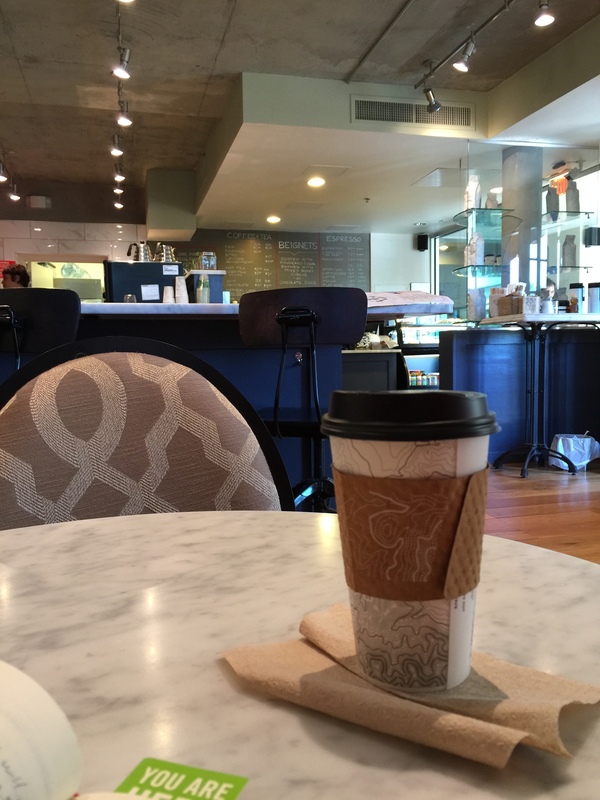 A coffee oasis in Santa Fe – 35° North Coffee. The staff or perhaps the owners/managers were incredibly friendly. I was ready to order a large house blend coffee, when what do my little eyes see written in big bold white chalked letters? Beignets. Oh my little paws were trembling with joy. I had to have an order with my coffee. The coffee was fresh and wonderfully roasted, but the star of this visit were the beignets. These are the real deal. I closed my eyes and felt as if I was sitting in the French Quarter in New Orleans. Yeah, that’s how good these bad boys are. This place is large so you don’t have to worry about coming in and not finding a table. Along with an assortment of pastries, and beignets, they have a nice variety of lunch items including sandwiches and salads, all made fresh to order. None of this premade crap you get from…well I won’t name the big chain coffee place down the street. You all are smart enough to figure it out. If you’re in the Plaza and needing a coffee fix, or even a quick and simple lunch, pass by the other place and get yourself over to 35° North Coffee. You won’t be disappointed. This place rocks! Cambridge has a lot going for it, but one of things I’ve always enjoyed here are the little corner markets, or around here called Spas. Why Spas? I’ve never really understood, but that’s okay. You don’t have to understand the Boston lingo, to enjoy one of the truly wonderful things in the city. Evergood Super Market is on Massachusetts Avenue in Cambridge. It’s a small grocery store, but it’s always well stocked. You need rose water for some obscure recipe, yeah, they’ve got it. (And one of the only stores in town that does). You need a can of collard greens? Yep, they’ve got you covered. They have packaged deli meats and cheeses, chicken, ground beef, well you get the picture. You need it, chances are you’ll find it in this store. Their breads are brought in every morning from Iggy’s bakery, their produce also comes from local suppliers. The selections are small, but no matter what I’ve needed, I’ve always found it at Evergoods. Some people complain that the items are overpriced. Look, it’s Cambridge, the rents are astronomical and for a small independent store to remain in business, they need to have higher prices. Frankly, I’d rather give a local mom and pop shop a few extra dollars every week, then to give it to Whole Foods, or worse yet, Star Market. If you live in Cambridge and are ever in need of a quick trip to the store, go to Evergood Super Market. They treat you like family, not like a paycheck. It’s worth it, and it might make you feel good knowing you’re supporting a small independent family run business. A win-win for everyone!